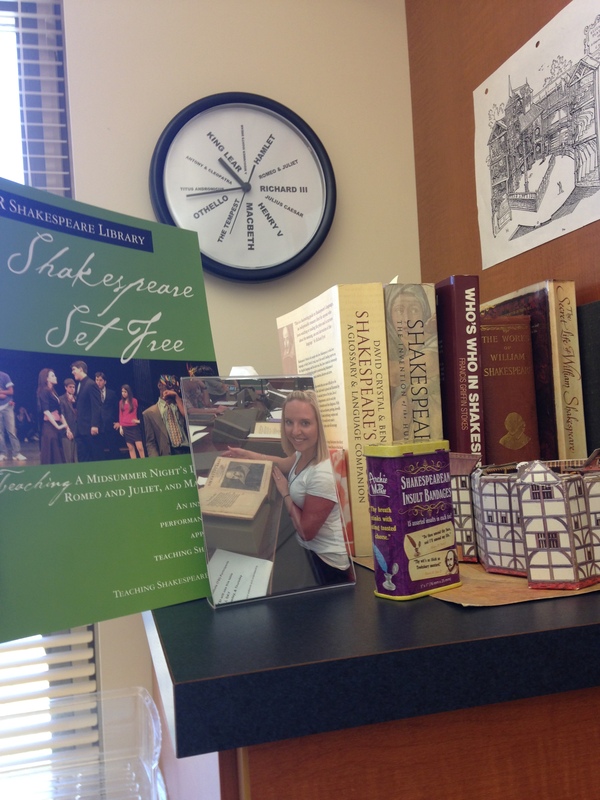 Ditch the Second Day Syllabus and Read Shakespeare Instead! 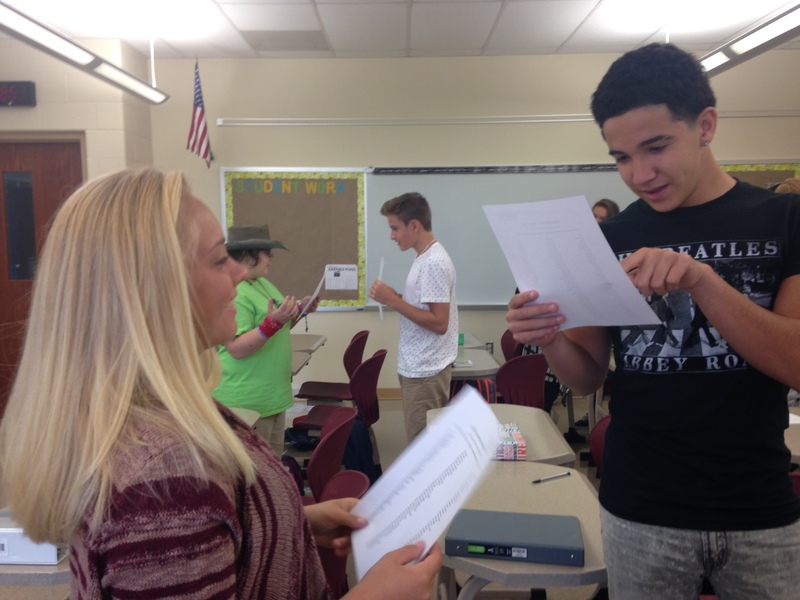 After my summer experience at the Folger Shakespeare Library, I decided that I was going to get my students up and moving around my classroom in some sort of Shakespeare activity within the first three days of school. And guess what? I did just that! On day two of the new school year, I ditched the rules and procedures protocol, and instead, each of my classes participated in a Shakespeare compliment activity (an activity that I first experienced first-hand this summer). I do something similar to this in March when we begin Romeo and Juliet; however, instead of Shakespeare compliments, they spew Shakespeare insults at one another. I never thought this was something my 9th students could handle on day 2, but I was totally wrong! They were moving – something that doesn’t occur in many classes the first week of school. A student told me she couldn’t pronounce a word. I told her that whatever she says is correct (another thing I brought back from the Folger). This led into a quick chat with the class about pronunciation and how it’s rude to constantly be correcting someone. I want all students to feel comfortable and confident when speaking up in class! This activity helped set expectations. At the sound of my voice, the students said one final compliment and then headed back to their seats. Some of the rules and procedures of my classroom were explained when I introduced this activity – win/win! I could gauge the dynamic of the group by seeing the way they interact with others. THEY READ SHAKESPEARE, and they enjoyed it! In my school district, my class is the first time they are introduced to Shakespeare. This definitely piqued their interest a bit. So go ahead and ditch that second day syllabus and get those students up and complimenting one another using Shakespeare’s words! It’s hard to believe a new school year is beginning once again. But what’s even harder to believe that this will be my 10th, yes you heard right, TENTH year teaching high school English. Over the past ten years I’ve had some amazing and humbling experiences. I’ve directed and produced three musicals, began a reading course for struggling students, moved to a new school district, participated in conferences that took me all over the country, won national English teaching awards, and became president of the PA Council for Teachers of English and Language Arts. I’ve gotten to know and collaborate with respected authors and educators from across the world. Most importantly, I’ve watched thousands of students move from 9th grade to college, growing academically and socially. I’ve seen non-readers become excited, avid, can’t-take-a-book-out-of-their-hand readers. I’ve had the awesome pleasure of witnessing students become excited about reading Shakespeare, scream with joy after receiving a book signed by an author (special thanks to Jay Asher, Steve Chbosky, and the late Walter Dean Myers) to students who were dealing with issues high schoolers should never have to deal with. I’ve been invited to former student college graduations, weddings, and sadly I’ve attended too many student funerals. And through all of those memorable moments, there is another one that I have the pleasure of adding to my list. This life-changing experience occurred over the course of one of the most memorable weeks of my life, and it will make a lasting impact on my teaching (and writing, too). If you know me, I’m sure you know what I’m talking about. The Teaching Shakespeare Institute at the Folger Shakespeare Library, which I now like to refer it as Shakespeare Camp. It’s been a month since Shakespeare Camp (which is so much easier to explain this week of Shakespeare awesomeness to my non-teaching friends and family) and I cannot stop thinking about it. As I sat through three days of valuable in-service sessions this past week (I got a lot out of a number of presentations) at my school district, I found myself thinking back to that week of awesomeness just a little over a month ago. Oh, how I wished I was sword fighting on the Folger’s lawn, listening to engaging lectures by the scholars and Folger text editors, performing on the United States’s only Elizabethan stage, and collaborating with 26 other like-minded, Shakespeare obsessed colleagues (many of whom I now call friends). As I think back on that experience, there are three things I want to take with me as I teach this year in order to keep the Folger memory alive and especially to create a memorable 9th grade year for my 100 plus students. 1. Relinquish control. If you’re a leader, teacher, boss, parent, you understand the difficulty in relinquishing control. But that’s one of the things that I want to work on this year. By relinquishing control (not total control, though), I am placing the learning into the hands of my students, in turn creating a memorable, authentic, and challenge-based learning environment. When I get to the acting of Romeo and Juliet, I know relinquishing control will be a struggle – but with my tools and tips from Shakespeare Camp, I know it can be done. 2. It’s all about the words. Sometimes we get so focused on teaching specific reading skills and strategies (thank you, standardized tests) we forget about the words. When students simply read words (often times through repetition), meaning begins to form organically. From Goodreads: Something freaky’s going on with Sunshine’s new house . . . there’s the chill that wraps itself around her bones, the giggling she can hear in the dead of night, and then the strange shadows that lurk in her photographs. But the more weird stuff that happens, the less her mum believes her. Sunshine’s always had a quirky affiliation with the past, but this time, history is getting much too close for comfort . . . Okay – so I’m a total sucker for a good scary story/mystery, and The Haunting of Sunshine Girl does not disappoint. I picked this book up at my local library, admittedly, because of its awesome cover. Because I do not judge a book by its cover alone, I read the inside blurb and knew immediately that this was going to be my next summer read. I started the book Tuesday night and finished it Wednesday afternoon. The pacing is spot on for a mystery, you feel for Sunshine, and there is a supernatural twist I did not see coming. And if you enjoy a good scare – this is worth reading (I had to distance myself from it before bed Tuesday night – didn’t want nightmares!) I didn’t realize that the story originated in the form of a youtube web series, but I look forward to checking them out. When I begin the school year (in a week – ahhh! ), I will most definitely be recommending this novel to my 9th grade students.